Margaret Koch, a Registered Nurse, passed away on Monday, August 20, 2018 at the age of 87 years. Beloved daughter of the late Mary Magner Koch and August G. Koch. 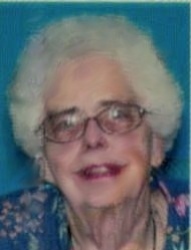 Sister of James J. Koch and the late Duane J. Koch Sr. Survived by a niece Joy Koch and nephew Duane J. Koch Jr. Margaret was a graduate of the School of Nursing at Hotel Dieu. Relatives and friends are invited to attend the Funeral Mass at St. Christopher The Martyr Catholic Church, 3900 Derbigny Street, Metairie, Louisiana 70001 on Monday, August 27, 2018 at 12:00 Noon. Visitation will begin at 11:00 AM. The burial services will be at Greenwood Cemetery. Friends may send flowers or contributions to St. Christopher The Martyr Catholic Church is preferred.